A little over a month ago I decided to get something I’ve considered for a long time; chickens. 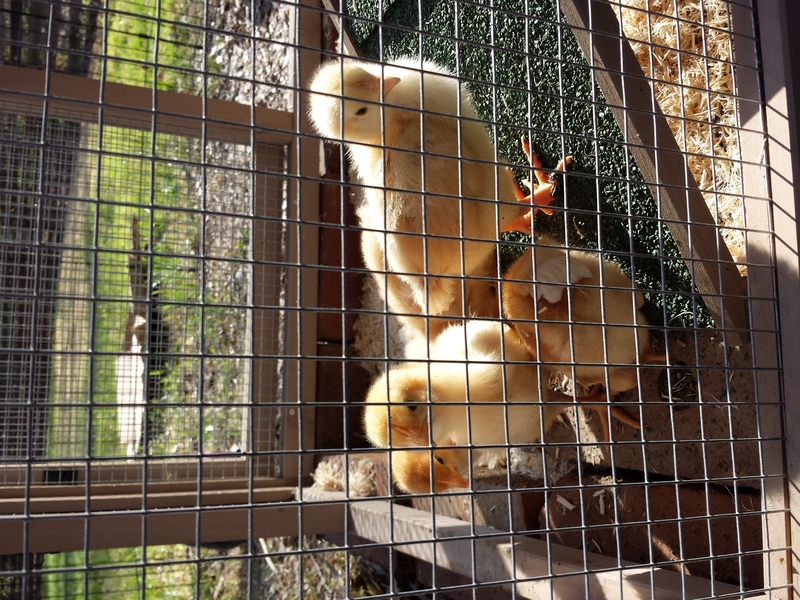 I heard chicks were available (for a limited time) at the local Tractor Supply Store, so after a brief review of a discount book I picked up years ago, some web surfing, and the much needed encouragement of my parents (who were visiting), we headed over to get a coop and some chicks. 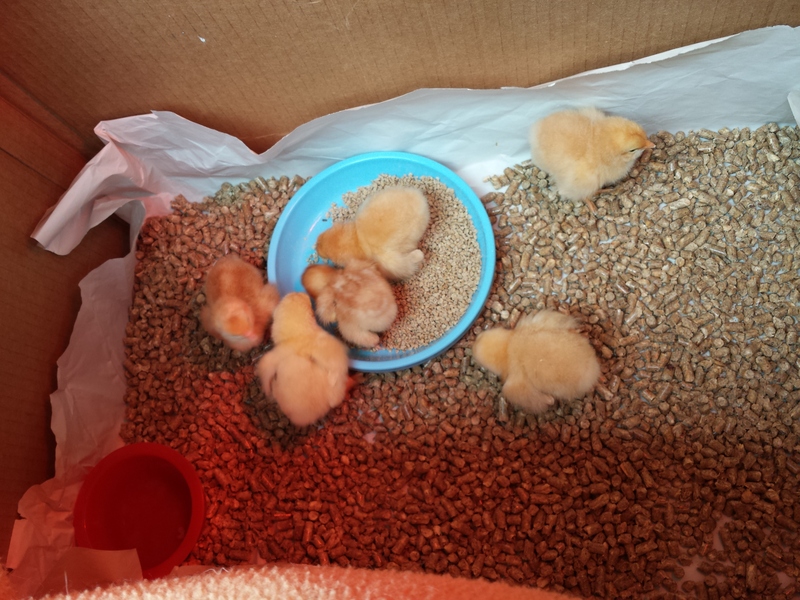 I think the helpful store clerks were probably laughing inside (at me, not with me) at the look on my face when the only chicks available were un-sexed and I had to buy at least six. 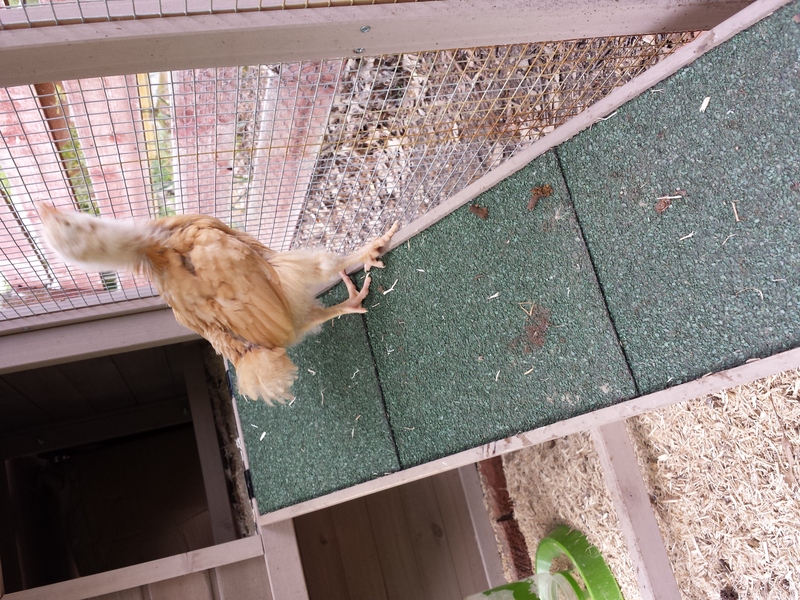 They also tried to convince me I should build my own coop which would be cheaper and sturdier. Their theory was sound; but they don’t know my building history like I do… more than likely it would have taken 2-3 days of taking it apart and putting it back together when my self-constructed pieces didn’t fit right. The time savings of buying something with pre-drilled holes and all the right parts was worth it (that being said, my dad did put together most of it anyhow!). 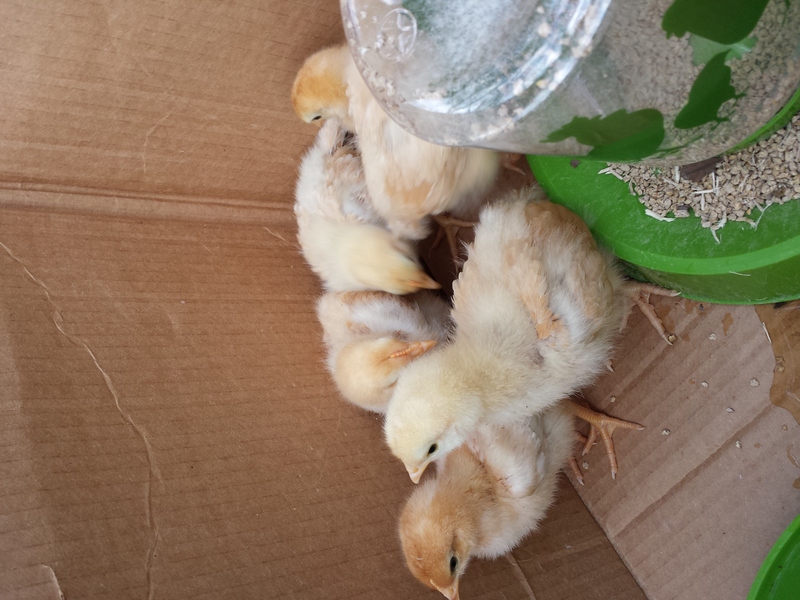 We loaded the coop, feed, heat lamp, and horse pellets into the hatchback I brought these cuties home. – They are so light… of course my Dad reminded me they couldn’t weigh much more than the egg they came from just two-days ago. – They are so unsanitary… they poop in and on everything. Duh, they are birds, why would I have assumed differently? Since then, my major observation is the irony that although chickens are a staple in many third world countries, they act like they are too dumb to take care of themselves. They poop in their water as soon as it’s refilled, they get out of the fence then spend all day trying to get back in, and they bite the hand that feeds them (ok, peck). Still, their instincts protect them in so many other ways, like when they hid from a predator by backing inside cinder blocks and they practically lay on top of each-other when it’s a cold night. After 5-weeks, they now look like smaller versions of their adult selves, they free range in my yard all day and put themselves to bed at night. Although the coop was expensive, feed is cheap (about $3 a week) and by moving the coop every other week I really only have to change the bedding in their roosting area daily. We have lost one, I suspect to a hawk, but since I wasn’t here there’s no way to be sure. I hope it was one of the roosters since it seems we won’t really know their sexes for another 6-weeks and am glad we hadn’t named them yet. It has been a unique learning experience and I hope it continues to be as we start to get eggs and maybe someday hatch out new chicks. 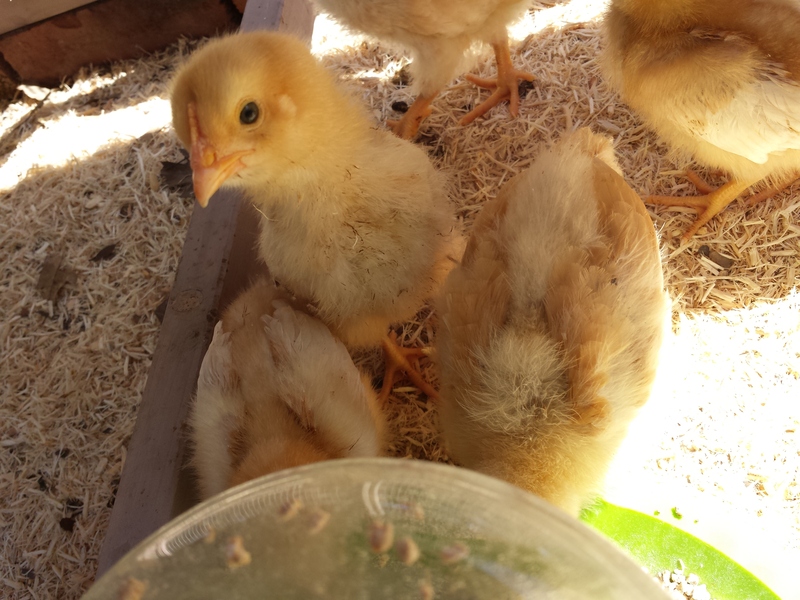 I know Mr. C loves trying to catch his “baby chicks” (boy they are quick!). He is learning about the responsibility of caring for animals, the cycle of life, and eventually where his food really comes from which is invaluable. Do you want suggestions for names? Benedict, Cordon, Chili, Rotisserie and Casserole.